We are delighted to announce Stephen Baker as winner of the 2018 Jeremy Allen Award. 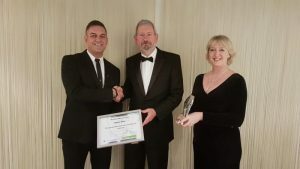 Stephen was presented with the award on the evening of 15th November 2018 during the Institutes’s National Training Conference Gala Dinner. Stephen is the Chair of National Pubwatch, a position he has held since 2007. Stephen does this on a voluntary basis, juggling his day job with Thames Valley Police. National Pubwatch has a proven track record of bringing together the pub and hospitality sector, enforcement agencies and other stakeholders to work effectively at reducing the problems associated with alcohol and violence. The Jeremy Allen Award is an annual recognition awarded jointly by the Institute of Licensing and Poppleston Allen Solicitors. The award is open to anyone working in licensing and related fields and seeks to recognise and award exceptional practitioners.